I have a ticket. What do I do now? Once you have been issued a ticket, you have 15 days to implement one of the following options listed on the back of your Offence Notice (yellow ticket). If you do not exercise one of these options, you will be deemed not to dispute the charge and a justice may enter a conviction against you. Upon conviction, additional costs will be added to the total payable. If the fine goes into default, an administrative fee will be added and steps will be taken to enforce your defaulted fine. For example, information may be provided to a consumer reporting agency and for certain offences, including speeding, your driver's licence may be suspended. Choose this option if you would like to plead guilty to the charge. Sign the plea of guilty (Option 1) on the back of your ticket and pay the total payable (see below for payment options). Choose this option if you want to appear before a Justice to enter a guilty plea and make submissions as to penalty, including an extension of time for payment. If a Defendant wishes to dispute a POA charge then they are required to sign option 3 on the back of the Offence Notice and mail (or deliver personally) it directly to the Court Office. It is the Defendants responsibility to ensure that the Court Office has their correct mailing address. A trial date will be set and a Notice of Trial will be mailed to you. You must indicate whether you want your trial to be held in either the English or French language. Failure to do so will result in a trial being held in the English language. There will be an opportunity to speak with the Prosecutor on the day of your court date just prior to your appearance. www.payfines.ca and follow the steps that are clearly provided. You will need your credit card number (VISA or Mastercard) and your ticket number (see the front of your ticket - ICON code Location 1360 + 8 digits). What Should I do if I?m Stopped by Police? Avoid being confrontational with the officer. Don't argue your case on the roadside. You can choose to have a trial in court if you want. At night, turn on your interior light. Turn down your radio so you can hear the Police Officer and they can hear you. If requested, produce your drivers Licence, ownership information and valid insurance card. Ontario law requires that you produce these items when requested to do so by a police officer. 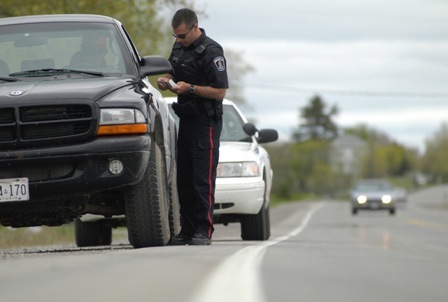 Why do Belleville Police issue Traffic Tickets? Road safety is of paramount importance to the Belleville Police Service. The Belleville Police Service incorporates high visibility, measurable outcomes, professional traffic stops and public education. Resources are directed towards identified hot spots for the purpose of reducing or eliminating collisions in a specific geographical area. These initiatives address high-risk behaviours involving occupant restraint, impaired driving and aggressive driving. The majority of our fatalities involve these three factors. This approach ensures a unified methodology focused on reducing injuries and saving lives, twenty-four hours a day, seven days a week, and three hundred and sixty-five days a year. The ultimate goal of traffic enforcement is to achieve voluntary compliance by all persons using the roads so as to reduce collisions and therefore injuries and or deaths.